I’ve been rather quiet on the blog, and I apologize for that! You see, we’ve been KILLER busy! According to our [back of napkin] business plan, ModeKnit Yarn, LLC wasn’t scheduled to begin working on acquiring wholesale orders until 2015. Kathleen and I both feel that one of the easiest mistakes to make with a new business is to grow it too quickly. 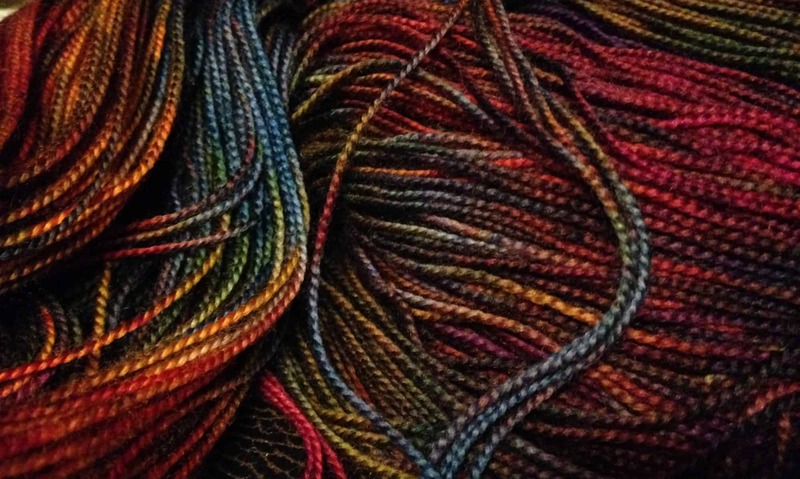 We didn’t want to create a demand that we couldn’t fulfill, and selling wholesale involves creating quantities of yarn that are just too big for us to turn out on a regular basis right now. 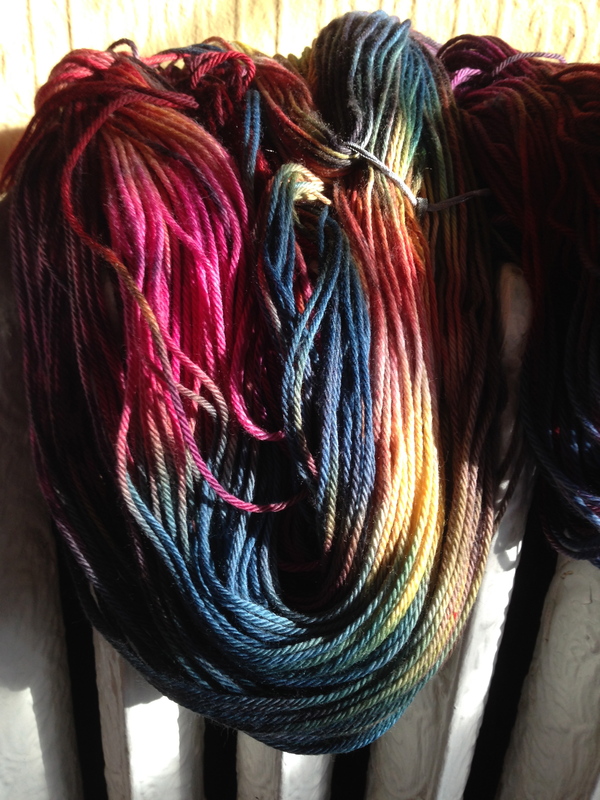 But then we were asked – so nicely – by a friend who owns a yarn shop in the LA area. 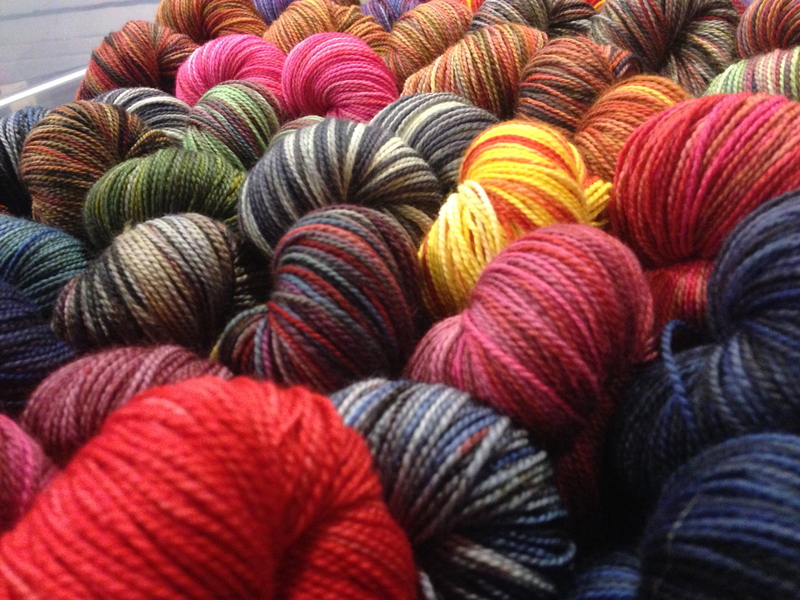 We will be supplying yarn to A Major Knitwork for the LA Yarn Crawl (April 3-6). This is a one-time adventure (well, until we begin doing wholesale on a regular basis in a year), and it’s been an incredible lesson in what it takes to put together just ONE wholesale order in a timely manner. Of course, the fact that we’re donating 30 skeins of yarn to our own Steven Be’s as bag stuffers for their Fiber Fest, and four mini-skein sets as door prizes for the MN Knitters Guild for Yarn Over in addition to the huge wholesale order – and our regular online orders which have kept up steadily – just added to the fun. Yeah, that’s the word I was looking for – fun. So while coming up with a new NO SPOILERS colorway set based on one of my favorite mid-century dramas I’ve been up to my elbows in merino, silk and dye. And it’s been one hell of a good time! I’ll be revealing the new colors (and my next inspiration TV show) next week. Right now I’m skeining up yarn so fast it makes poor Jasper the Standard Poodle’s head spin! Will you be coming with your yarn to A Major Knitwork? They are not my “home” shop, but I will be visiting them on the first day of the Yarn Crawl. I’d love to say hi to you as well! Congratulations! Can’t wait to see your yarn in my LYS.